Yes, we know what you're (probably) thinking: that's an ever so slightly risky name to give one's creative collective. Is FAILE simply an unfortunate acronym for something a little more lofty and worthy in meaning, or is this Brooklyn-based duo - consisting of Patrick McNeil (b. 1975) and Patrick Miller (b. 1976) truly committed to, well, failing? Befittingly enough, for practitioners known for their explorations of duality through a wide range of combined media, the answer to that question is... a bit of both. You see, FAILE is no acronym, but instead an anagram of 'A Life', the name of their first project, but there's also no question that the collaboration takes seriously the value of crashing and burning, Miller having previously urged budding artists to "fail to succeed". That's certainly a philosophy that FAILE has perfected to a fine art. McNeil and Miller first met as children in Arizona, only to initially go their separate ways in 1996 when Miller remained at art school in Minneapolis and McNeil headed to New York. But they - together with filmmaker Aiko Nakagawa, later a celebrated street artist in her own right as Lady Aiko - re-established acquaintance before the century was out, and the FAILE story had truly begun. At a time when street art was yet to gain institutional acceptance, the fledgling trio showed just how self-aware and sophisticated its practitioners had already become, travelling the world to dispense their distinctive wheat-pasted and stencilled creations onto unsuspecting urban streets. Along the way, they fine-tuned their subversive incorporation of '60s pop art influences such as Richard Hamilton, Andy Warhol and Roy Lichtenstein. In truth, FAILE always straddled the line between a DIY 'street art' aesthetic and more obviously gallery-ready 'fine art', although the collective was far from limited by such an ethos, with its early years being unquestionably varied and experimental - albeit, forced to a certain extent by a lack of permanent studio space and a nomadic practice. 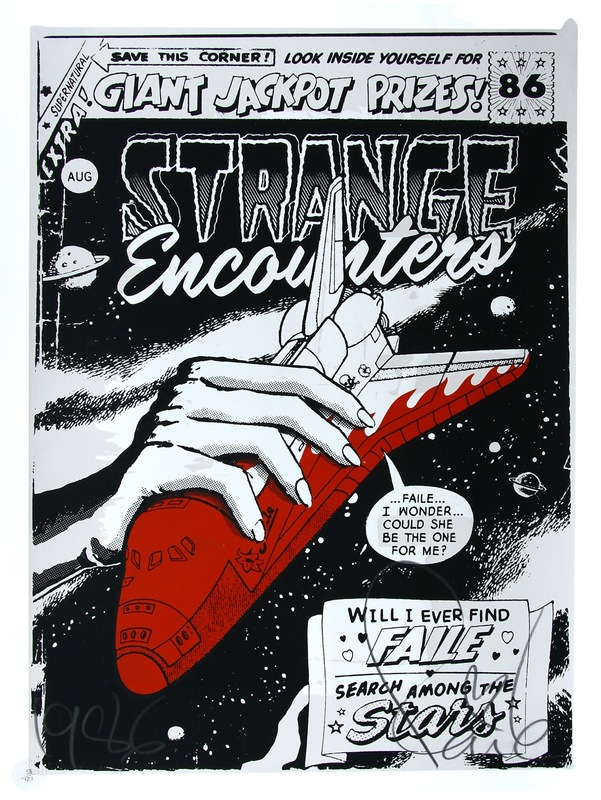 With contemporaries like Shepard Fairey and BÄST also exerting their influence on a trio of artists who were developing an idiosyncratic vernacular in their own right, FAILE began establishing its own unmistakable visual cues, such as the '1986' signature that referenced the Challenger space shuttle disaster. Even Nakagawa's exit from the collective in 2006 couldn't halt its steady march to commercial visibility. One of the most momentous steps in the group's career came in the perhaps unlikely location of Gateshead in northern England, where independent curator Pedro Alonszo oversaw Spank the Monkey at the BALTIC Centre for Contemporary Art from late 2006 to early 2007. The exhibition served as a showcase for just how far street art had come, with FAILE presented alongside other significant graffiti, street and design artists like Fairey, Banksy and Os Gemeos, together with celebrated 'fine artists' such as Takashi Murakami and Barry McGee. Works were displayed within the gallery itself as well as around nearby Newcastle, with the show widely hailed as a key milestone for the increasing legitimisation of street art in the gallery system. It shouldn't be so surprising, therefore, that the Tate was quick to signal its own ever-rising appreciation of the work of such urban creatives with its 2008 show that was simply titled Street Art. Again, FAILE played a key role, contributing a monumental 240-square-foot (22 square metre) image of a Native American in full regalia, affixed to the outside of the former Bankside Power Station in which the London gallery resides. It might be a slight understatement to suggest that McNeil and Miller haven't exactly done badly under the FAILE banner ever since. They have received commissions from such eminent and once-improbable sources as the New York City Ballet, while continuing to rack up high-profile exhibitions. The latter included last year's Brooklyn Museum-based Savage/Sacred Young Minds, which it was said "raises questions about our relationship to consumer culture, religious traditions, and the urban environment by blurring the boundaries between fine art, street art, and popular culture." The show featured a collaboration with BÄST known as The FAILE & BÄST Deluxx Fluxx Arcade, an intensely bright and interactive environment described as "a gamer's paradise" by The Huffington Post. It has been quite the journey for the two Americans - but is their success really attributable simply to a lack of fear of failure? Perhaps not only that, but there's no denying that the duo's proactive approach has played its part. As McNeil has previously said of what is required to become a successful street artist: "Getting out there and doing it is the ethos of street art. It seems like an amazing time to be making a statement."